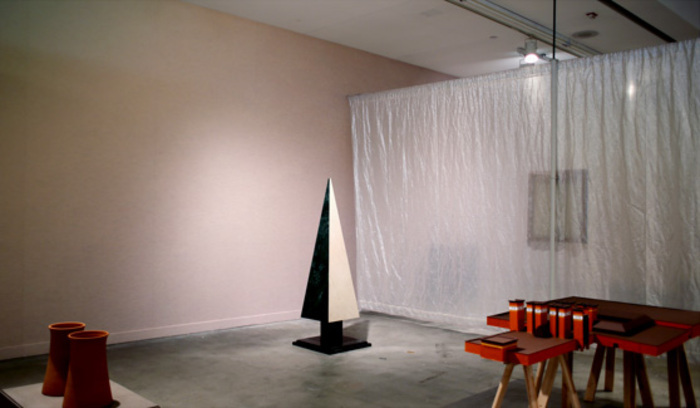 View of Small Museum for the American Metaphor, 2014, REDCAT, Los Angeles. Photo: Luisa Lambri. 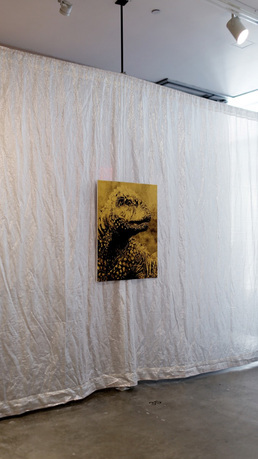 The publication Small Museum for the American Metaphor explores in detail the arguments made by the exhibition of the same name that was presented in the Gallery at REDCAT in 2014. The publication include a number of unpublished texts by Belgian architect and exhibition cocurator Kersten Geers, as well as an introduction by exhibition cocurator Ruth Estevez, the director of the Gallery at REDCAT. The publication is illustrated with photographs of the exhibition by Italian photographer, Luisa Lambri. The publication expands upon themes central to the exhibition, such as the European idealization of the American West as "wide-open" and the reinterpretation of the world as a gigantic interior space. Using the tools and methodologies of an art exhibition, the publication takes an experimental approach to the fields of architecture and urbanism. The publication is designed by Joris Kritis. 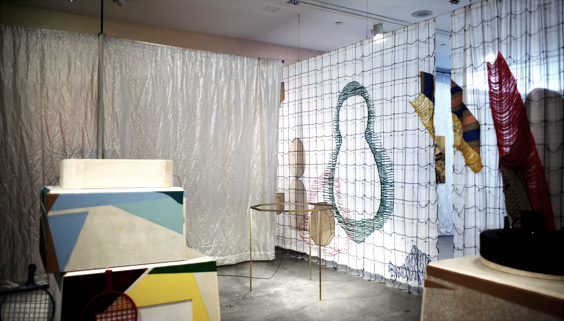 Since 2012, Ruth Estevez has served as the director and curator of the Gallery at REDCAT, Los Angeles, where she has been organizing exhibition with artists such as Javier Tellez, Pablo Bronstein, Allora & Calzadilla, Joao Maria Gusmao and Pedro Paiva, and Andres Jaque, among others. From 2007 to 2011, Estevez served as the chief curator at the Museo de Arte Carrillo Gil, Mexico City, where she curated various exhibitions and projects with Mark Manders, Guy Ben-Ner, and Fernando Ortega, among others. In 2010, Estevez cofounded LIGA–Space for Architecture, the first space in Latin America devoted to the critical reflection and presentation of architecture and urbanism. Estevez has written extensively for various exhibition catalogues and art publications. Estevez holds a BA in fine arts for the Basque Country Public University, a master's degree in art history from Mexico's National Autonomous University, and a PhD in art history from the Universidad Complutense, Madrid. Kersten Geers studied at the University of Ghent and at the Escuela Técnica Superior de Arquitectura in Madrid, Spain. He worked in Rotterdam for Maxwan/Max.1 Architects until 2001, and from 2001 to 2005, for Neutelings Riedijk Architects. He was a tutor at the TU Delft, the University of Ghent, and the Accademia di Architettura di Mendrisio, and a guest lecturer and guest critic for the Berlage Institute in Rotterdam and Columbia University, among other institutions. He is a founding member and editor of San Rocco magazine, and frequently publishes essays on architecture in a variety of magazines and books. In 2002, he founded OFFICE Kersten Geers David Van Severen, together with David Van Severen. In 2008, they were awarded with the Belgian Prize for Architecture and, in 2010, the Silver Lion at the 12th Venice Biennial of Architecture. Luisa Lambri currently lives in Los Angeles. Her work has been included in two Venice Biennales: dAPERTutto, the 48th International Art Exposition in 1999, for which the Italian Pavilion was awarded the Golden Lion, and Dreams and Conflicts: The Dictatorship of the Viewer, the 50th International Art Exposition in 2003. Her one-person exhibitions have been presented internationally at venues including the Baltimore Museum of Art, Baltimore, MD; the Menil Collection, Houston, TX; the Palazzo Re Rebaudengo, Guarene d'Alba, Italy; and the Hammer Museum of Art in Los Angeles. 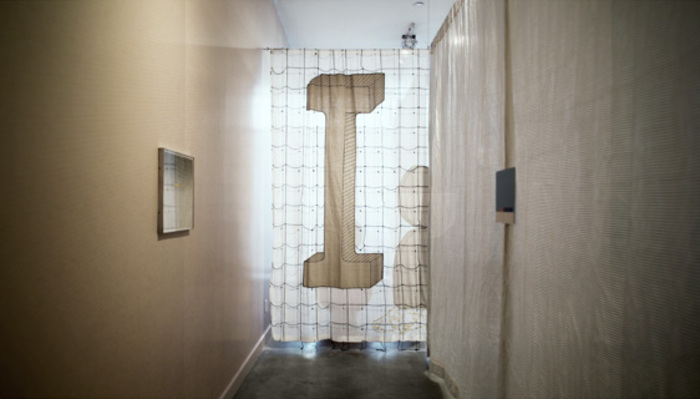 Forum 57: Luisa Lambri and Ernesto Neto was presented at the Carnegie Museum of Art in Pittsburgh 2006. 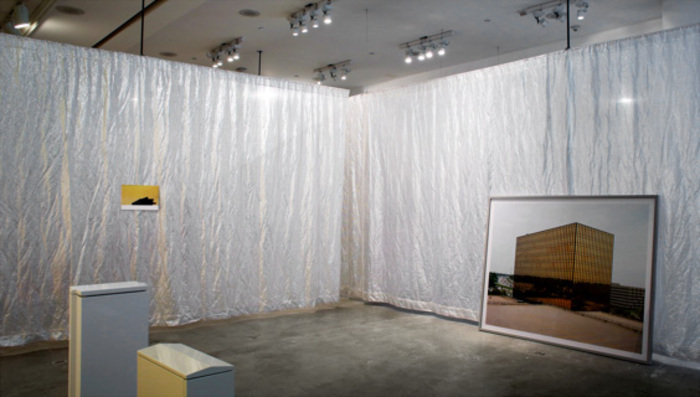 Lambri's work has been included in thematic exhibitions, including Italics: Italian Art between Tradition and Revolution, 1968–2008, Museum of Contemporary Art, Chicago; 31 Panoramas of Brazilian Art, Museum of Modern Art, Sao Paulo, Brazil; Painting the Glass House: Artists Revisit Modern Architecture, Aldrich Contemporary Art Museum and the Yale School of Architecture, New Haven; and The Shapes of Space, Solomon R. Guggenheim Museum, New York, among others. Joris Kritis studied graphic design at Sint-Lucas Ghent and was a participant at the Werkplaats Typografie between 2006 and 2008. Since 2009, he has worked as an independent graphic designer. From 2009 to 2011, he designed the arts review Metropolis M, in collaboration with Julie Peeters, and in 2010, they restyled the graphic identity of the Beursschouwburg in Brussels, which won the public prize in the Cobra Power of Print competition. His clients include the Royal Museums of Fine Art, Brussels; Contour Mechelen; the Appel Curatorial Programme, Amsterdam; ROMA Publications; OFFICE Kersten Geers David Van Severen; the Canadian Centre for Architecture; the Piet Zwart Institute; Architecture Workroom Brussels; BOZAR, Brussels; If I Can't Dance ..., Amsterdam; Elisa Platteau Gallery, EPFL, Lausanne; and the Flemish Architecture Institute. His work has been selected for the Brno Biennale, and with the book Changing Cultures of Planning, he won the Prix Fernand Baudin, as well as a bronze medal in the Most Beautiful Book of the World Competition in Leipzig. The Flanders Architectural Review (2012) was selected for the Best Designed Books in the Netherlands. He has been teaching at the Gerrit Rietveld Academie since 2011, and has offered workshops in Ghent, Oranjenstadt, and Talinn. REDCAT (Roy and Edna Disney/CalArts Theater) is an interdisciplinary arts center that introduces diverse audiences, students, and artists to the most influential developments in the arts from around the world, and provides emerging artists and cultural organizations in the region with vital opportunities to develop and present new work. REDCAT was launched by the California Institute of the Arts (CalArts) in 2003 to create a downtown center for contemporary art, dance, theater, mixed media performance, film/video, and literary programs.